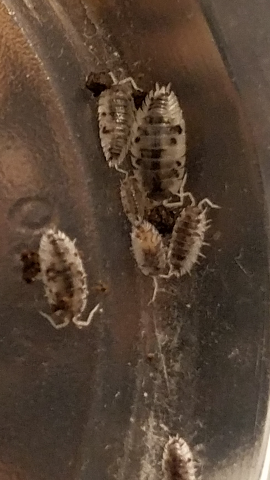 The animals previously photographed have matured and began breeding and are definitely not Dalmatian but aren't normal either, they have a sort of tan color and when I isolated 2 of them they have produced a good amount of Dalmatian offspring. My colony may be a co-dominant trait. Interesting, definitely seems to be different genetics at work than in my strain! Keep us updated on them! @Hisserdude I'll keep you updated, you also have said you have had lighter animals pop up in your strain so maybe the lighter animals are related to the Dalmatian gene. I'l try and get a comparison shot between one of the second generation offspring with the sort of tan color I'm seeing and my normal male later. 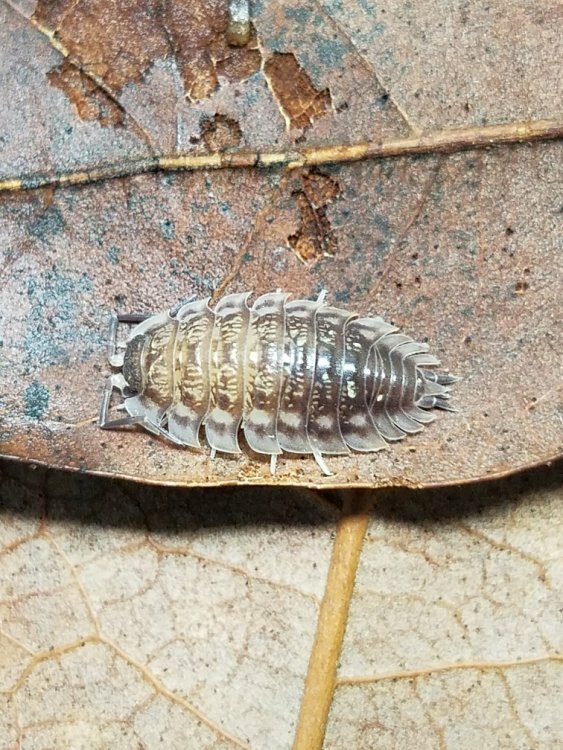 Here is a close up of what I discovered to be a dark pigmented spot that showed up on another light isopod, I did flip it over to check if it was Dirt and gently swabbed the spot on both sides, definitely part of the coloration. 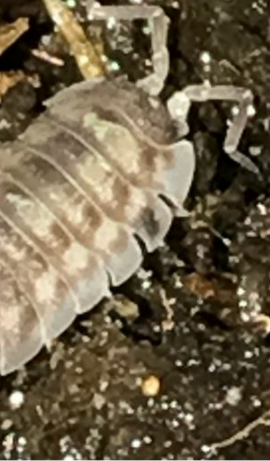 The isopod in this post actually has developed another black spot and abnormal gold flecking, but has an orange/grey/tan base color. Its like it has the spots of the Dalmatian isopods except with a tan base color and not white. Here is a full grown specimen showing the lighter coloration I'm seeing. I wouldn't say they fall outside the normal spectrum completely but almost every offspring is that lighter color which contrasts when I put one next to my original male for example. My main colony is like half normal individuals, and half that look like this one. I've tried isolating orange tinted juveniles produced by light individuals like these, but they always just come out kind of tan by maturity. Well mine is also fully isolated now. Here are a few younger ones. I would say now that I have a group of animals it still looks like these are a little darker but I'm not sure. I also outcrossed pretty heavily to normal individuals as my colony expanded I wanted a larger gene pool. I just kept adding them in a few at a time and then recently I started pulling any Dalmatian animals out that I found. Nice, they look pretty similar to mine! Doesn't seem like they have as many gold flecks on them though, unless I just can't make them out in the picture? Only some of them have gold flecks in my colony. Definitely seems like they are a slightly different from my dalmatian strain then. Now we gotta test cross a few! Also some of mine aren't a clean white color, they are like a light grey with black and yellow spots overlaying it.